In February of 2018, I warned investors of Emerson Electric's potential downside and suggested a more defensive investment. 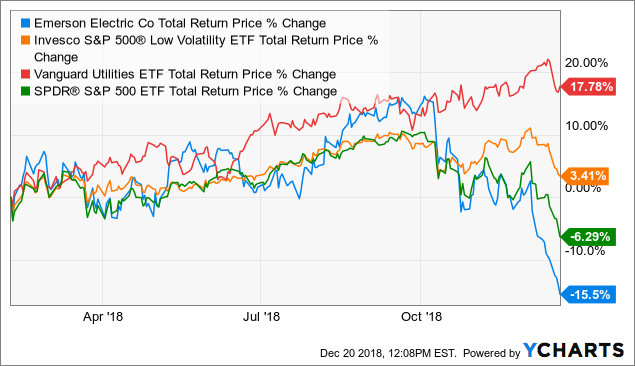 By December of 2018, after Emerson's price had dropped significantly, I suggested investors who rotated out of the stock rotate back in with a healthy share gain. I purchased the stock myself during the December sell-off, but now Emerson's stock price is higher than when I first warned of its downside. 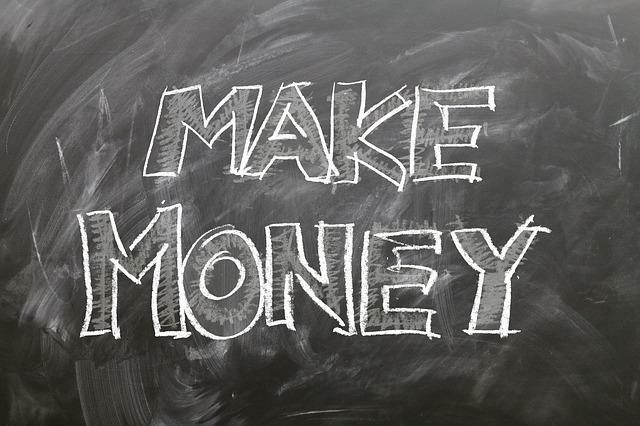 This article reviews my overall strategy and explains what I'm doing now. On February 7th, 2018, I published an article titled "How far could Emerson Electric fall?". In that article, I pointed out that Emerson Electric (EMR) was a highly cyclical stock which was subject to frequent and significant drawdowns in excess of -30%, and I shared the table below which contained all of Emerson's significant drawdowns for the past several decades, when they started, how deep they were, and how long it took for the stock to recover its previous high price. What's most interesting about these data is that from the time Emerson bottomed in 1974 until it peaked in 1999, with the exception of a fairly brief sell-off during the 1987 crash, Emerson had no significant declines. But, since 1999, it has had 5 significant declines in less than 20 years. This tells me that Emerson is a much different investment today than it was 40 years ago. If we set aside the 1970s, and focus on the more recent history, I think it's fair to estimate that during EMR's next downcycle, we might expect that if it happens outside of a larger economic contraction, EMR might decline 30-40% from its highs and take 2-4 years to recover, and if the downturn happens during a recession, then we could expect a 45-55% decline and a 3-5 year recovery. I went on in the February 2018 article to point out that the risk/reward at the time was not good for Emerson Electric if one were to include the assumption of a bear market beginning within the next three years, and that it would be wise for EMR investors to rotate out of the stock and into a 50/50 mix of PowerShares S&P 500 Low Volatility Portfolio ETF (NYSEARCA:SPLV) and the Vanguard Utilities ETF (NYSEARCA:VPU). 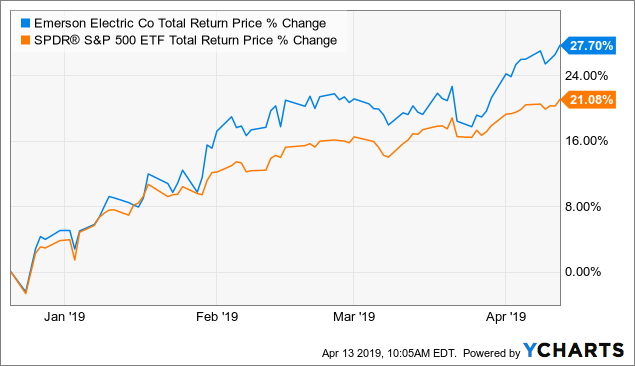 It should be noted that the reason I like these two ETFs is that, in both theory and practice, they have demonstrated less volatility than the cyclical stocks I've examined so far. Utilities have a long history as a defensive sector, and the SPLV is designed specifically to weight more heavily the least volatile stocks in the S&P 500. Nine months later, I wrote a follow-up article titled "Here's the price at which I'll start buying Emerson Electric." In that article, I shared the performance of the idea from my February warning article. Here were the results as of the publication of the follow-up article on December 21st, 2018. The average return of the defensive alternatives VPU and SPLV has been 10.60%, while Emerson's return has been -15.5%. A person who rotated out of Emerson and in into SPLV/VPU after my original article could now rotate back into EMR and own ~30% more shares at no additional cost. 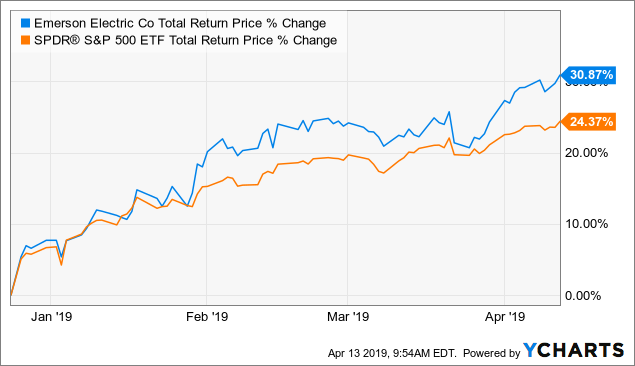 Judging from past downcycles, now is a reasonable time to rotate back into Emerson if you believe in the quality of the company long-term, and I now consider this a completed successful trade for rotational investors. So, an investor who owned 100 shares of EMR in February of 2018 and followed the rotational strategy, rotating into the two defensive ETFs, by December, could have rotated back into EMR and owned ~130 shares at no extra cost. These two different types of investors would naturally have different entry and exit points. Those investors who were mostly longer-term holders or income investors who just wanted to avoid some declines and gain some free shares, would only want to sell when the prices of the stocks had a very high probability of being near their cyclical highs, and, generally speaking, would rotate back into the stock as soon as the stock had declined enough to gain some free shares and avoid some of the losses associated with the decline. The investor buying from a cash position, however, was more of a value-oriented, medium-term, total return investor, and would be more likely to wait for a deeper price decline that included a bigger margin of safety, and also to sell a little sooner, before the stock becomes clearly overvalued. For example, let's say a cyclical stock at its peak trades at $100 per share and at its trough trades at $50 per share. I have 5 different types of articles I'm likely to write about the stock. As the stock approaches $100 per share, I would write a "How far could XYZ fall?" article about the stock, warning everyone of the potential decline and sharing defensive investments I thought were better. The next type of article I would write is "Here's the price I'll start buying XYZ". I used these articles for a mix of purposes. Sometimes it was a clear warning that the stock price had further to fall, so the article served a similar purpose as a "How far could they fall?" article (usually these were stocks I hadn't yet written a 'How far could they fall?' about yet, like Micron (MU).) Other times I simply used them to explain when I would start buying the stock from a cash position. And often times I would use these types of articles to both tell rotational investors they could rotate back in, while also explaining the price I was waiting for to buy the stock from a cash position. The reason I tended to combine these functions into this one type of article is that I always try to pack as much value into my articles as possible. I also wrote monthly updates where I tracked the results of the ideas, and sometimes in those updates, I would give the 'okay' for rotational investors to get back in. In addition to these types of articles, I would write articles when the price fell far enough to buy from a cash position ('buy' articles), and when they had risen enough for those who bought it from a cash position to take profits ('taking profit' articles). So, for stock XYZ, I would write a "How far could XYZ fall?" article around $100, a "Here's the price I'll start buying XYZ" around $80, a "Go ahead and rotate back in" article or update around $65, an "XYZ is a buy" article around $55, and an "I'm taking profits" article around $90 on the way back up. And then if the stock keeps rising to say $110, I might write a new "How far could XYZ fall?" article again. Today's article is an "I'm taking profits" article, and it is directed at value-oriented, medium-term, total return investors like myself. 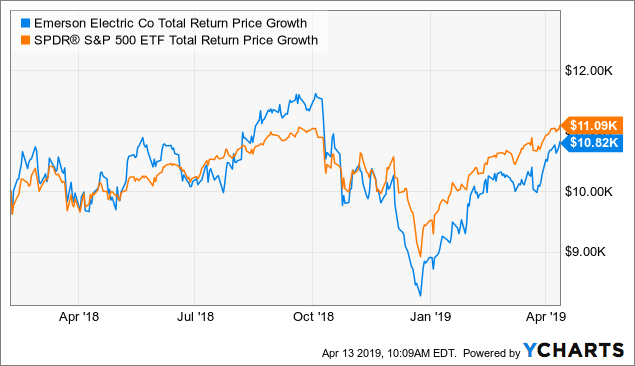 Longer-term income investors might want to wait a little while for EMR to be closer to its all-time highs before they consider rotating out of the stock. Now let's review how the investment performed. In my December 21st article, I both gave rotational investors the okay to rotate back into Emerson and I named the price I would be looking to buy from a cash position. That article came out on a Friday, on the next Monday, December 24th, Emerson hit my announced buy price. At the time, the market was in freefall and I was buying stocks left and right. I didn't personally buy Emerson on the 24th, not because I was worried about the market falling, but because I had so many other more lucrative opportunities in higher beta stocks that were near their buy prices I wanted to make sure I had enough cash available for those more lucrative opportunities if they fell a little further. After about three days, the market panic stopped and it was clear I wasn't going to get many more opportunities on the more lucrative stocks, so I purchased Emerson myself. Here is how the stock has performed since it hit my buy price on December 24th. But they are still respectable. There's not much of a contest between the three strategies in this case. The rotational strategy wins easily. 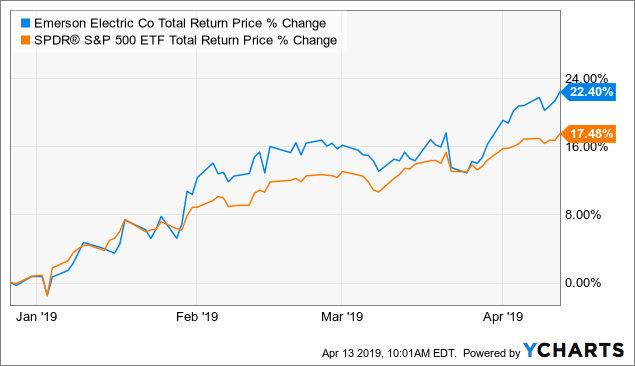 Emerson is the third cyclical investment in which I've realized profits in 2019. Cummins (CMI) returned about 20% and Tiffany (TIF) returned about 25%, both in a matter of months. So 2019 is off to a good start. Looking forward, I'll be keeping an eye on Emerson and where we are in the business cycle. If the stock begins to make new all-time highs and we remain in the later stages of the business cycle, I'll probably examine how far it might fall during the next downturn again. If you would like to receive updates on more cyclical investing ideas, click the orange 'follow' button at the top of the page and you'll be notified when I publish new articles.